I finished quilting Mom’s dog quilt last night so today, that one got trimmed and it’s ready to go back to Virginia with her for binding. 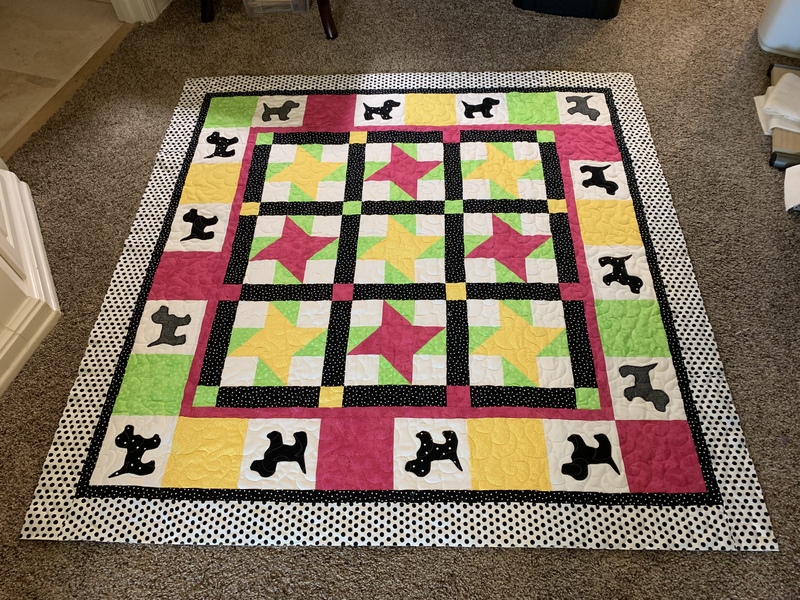 She used the dog die from Accuquilt and the pattern was free on their site too. 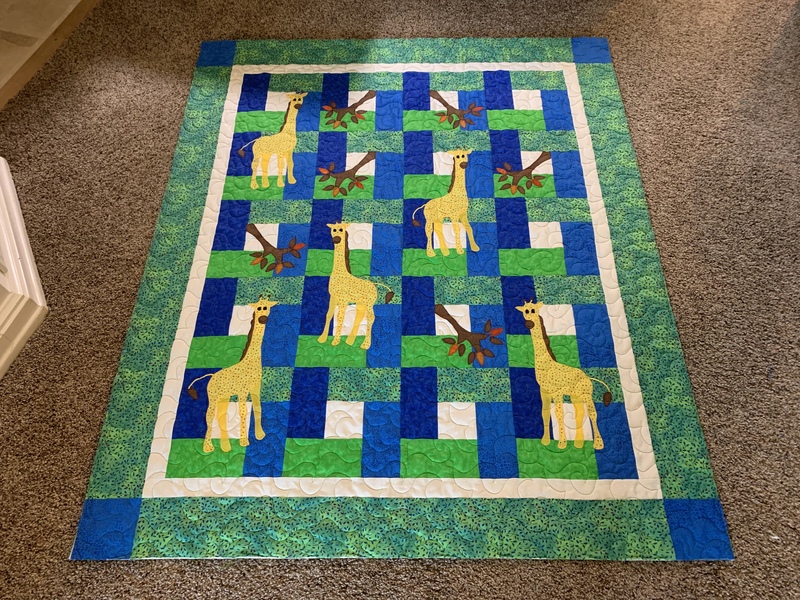 I also got her giraffe quilt trimmed. This one was from the Animal Parade book and it’s also ready to go back home with her for binding. We made the alternate blocks for her Schoolhouse quilt and we just had to toss them up on the design wall to see how it’s going to look. The borders are cut too and this is all packed up and already in the first box we shipped home to her. The pattern is from an old book I bought used off Amazon. We didn’t put the border up there but it will have the blue print in a 5 inch finished border with red cornerstones. She’s going to have a LOT of appliqué to stitch down when she gets home! And finally, we cut 3 Strippie quilts and they’re all kitted up for her too. I’m always on the lookout for cute kiddie fabric and had a bin full for her to choose from – she picked the dinosaurs, the owls, and the ladybugs. I’ve got 2 more tops to get quilted before she goes home but we’ll have to get to Joann’s before I do the last one because we want a flannel backing for it. I’m so impressed with how industrious you both are! I could use that kind of organization and incentive. Nowyou are up to a full year of my quilting, but you are having fun. Darling, especially the dog quilt. Question….how do you keep your points in the star block? My points always get too far on the edge and get lost. Suggestions appreciated! You are so good to your Mother. The quilts are fabulous. What a team you make. And mailing the packages ahead such a great idea. All of those quilts are really cute! What does she do with all of them? I love the schoolhouse layout. I love your mom’s quilts!! They are so colorful and happy. She must love being able to use your design wall as she works so furiously fast. I can’t get over how much you both accomplish! You both certainly enjoy your time together. Love all of your Mom’s appliqué: the giraffes are adorable. Looks like your Mom enjoys being busy – just like you. Together you are an unstoppable team! Great quilts. You must have inherited your Mom’s energy. You guys are dynamos. Those kids’ quilts are so cute. Some one is going to be so lucky to receive them. I wish I had half the energy of you and your mother. Amazing how much you two get done. The quilts are such happy quilts and beautiful too!